Contractors working from a specially fabricated platform work on cleaning the replica Saturn V rocket at the U.S. Space & Rocket Center in Huntsville, Alabama. Three Saturn V rockets survive today as artifacts, including one displayed inside the Davidson Center for Space Exploration at the U.S. Space & Rocket Center. The historic hardware, though, is all exhibited horizontally, on its side. The replica is the only vertical display of the Saturn V in the world. 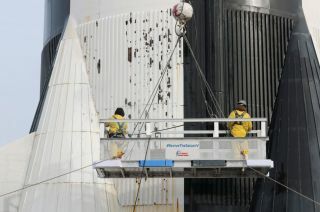 Work has begun to clean and paint the replica Saturn V rocket at the U.S. Space & Rocket Center in Huntsville, Alabama.